When you stumble in the dead of night and struggle to find the light switch. Fortunately for you there is one right by the door, but what about the light in your bedroom that you always trip over something to get? You can sleep on the couch or when you turn the light switch on that is right by the door, it illuminates your pathway to the comfort of your bed. The code for Photon 1 uses a publish function to upload its current status of the kitchen light to the particle console. It reads either intact or broken, where intact means that the kitchen light is on, and broken means that the light is off. The Photon 2 uses a subscribe function that reads the particle console and changes the state of the bed room light. Our first Photon setup is comprised of a mini-breadboard, Particle Photon, 220 ohm resistor, photoresistor, LED light and wires. The LED light is connected from DO to GND on the photon. The resistor is connected from A0 to GND and the photoresistor is connected from A0 to A5. Our second photon setup is made up of a mini-breadboard, relay, photoresistor, particle photon and wiring. The photoresistor is connected from A0 to A5. A grounding wire is connected from A0 to GND. The red and yellow wires shown below are connected to D0 and D5 on the photon, and lead to the relay. The lamp is hooked into the Normally Open (NO) terminal of the relay and finally connected to a wall outlet. This graph shows the switch of the 2nd photon vs. time. 100% is light on and 0% is light off. 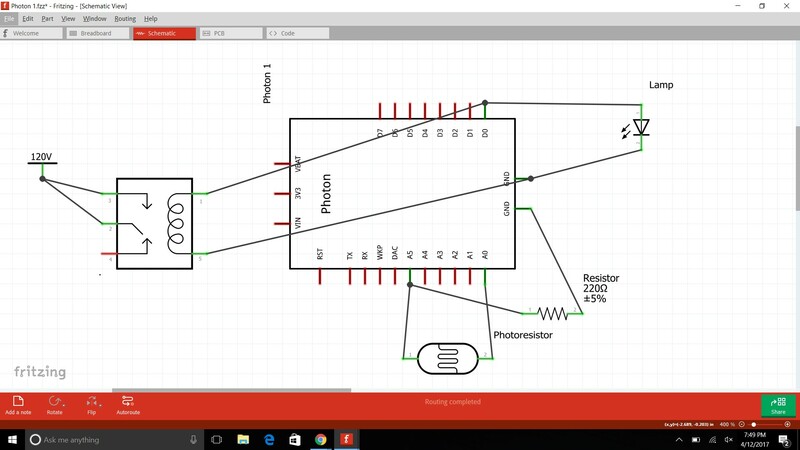 // This app will publish an event when the beam of light between the LED and the photoresistor is broken. // It will publish a different event when the light is intact again. // Just like before, we're going to start by declaring which pins everything is plugged into. int led = D0; // This is where your LED is plugged in. The other side goes to a resistor connected to GND. int boardLed = D7; // This is the LED that is already on your device. // On the Core, it's the LED in the upper right hand corner. // On the Photon, it's next to the D7 pin. int power = A5; // This is the other end of your photoresistor. The other side is plugged into the "photoresistor" pin (above). int intactValue; // This is the average value that the photoresistor reads when the beam is intact. int brokenValue; // This is the average value that the photoresistor reads when the beam is broken. int beamThreshold; // This is a value halfway between ledOnValue and ledOffValue, above which we will assume the led is on and below which we will assume it is off. bool beamBroken = false; // This flag will be used to mark if we have a new status or now. We will use it in the loop. 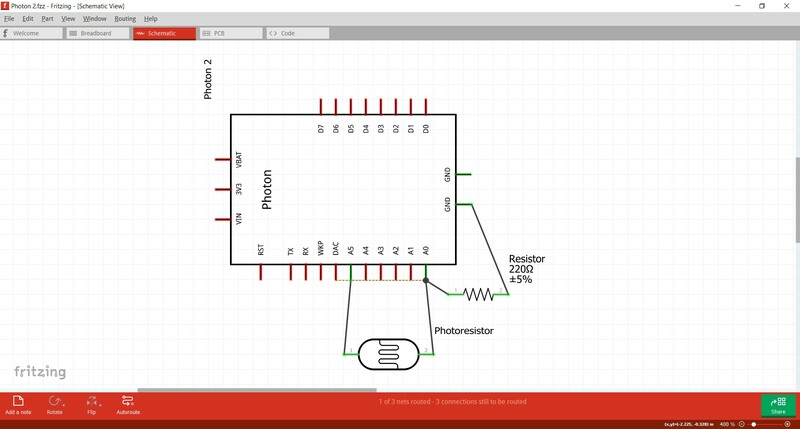 // Next, write the power of the photoresistor to be the maximum possible, which is 4095 in analog. // Since everyone sets up their leds differently, we are also going to start by calibrating our photoresistor. // Now flash the D7 LED on and off three times to let us know that we're ready to go! // Let's also calculate the value between ledOn and ledOff, above which we will assume the led is on and below which we assume the led is off. // Now for the loop. /* In this loop function, we're going to check to see if the beam has been broken. so that if we want to, we can check from other devices when the LED is on or off. We'll also turn the D7 LED on when the Photoresistor detects a beam breakagse. /* If you are above the threshold, we'll assume the beam is intact. If the beam was intact before, though, we don't need to change anything. We'll use the beamBroken flag to help us find this out. This flag monitors the current status of the beam. and when the beam reconnects it is set to FALSE. // If the beam was broken before, then this is a new status. // We will send a publish to the cloud and turn the LED on. // And flash the on-board LED on and off. // Finally, set the flag to reflect the current status of the beam. // Otherwise, this isn't a new status, and we don't have to do anything. // If you are below the threshold, the beam is probably broken.